Restorable motor consists of: fully intact motor, including wire harness and plug, “minimal pitting” on outer surface of barrel and brush holder end plate, with minimal corrosion on gear housing; thus enabling a proprietary surface cleaning to achieve a presentable fresh plating. If any internal parts, such field assembly, armature, or drive gear are damaged needing replacement, there will be an additional charge. 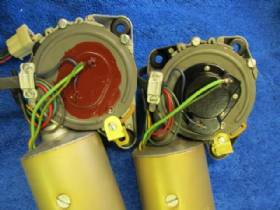 All OE Restored wiper motors for with With core purchase option motor in exchange must be same part number & close date code to one purchasing. NO EXCEPTIONS !!!! We Do Not Invoice Or Ship Purchased Motor, Be It OE, Low Budget Or Your Specific Motor Until Your Fully Restorable OR Exchange Motor Is Received, And Inspected To Meet The Qualifications Of Fully Restorable Motor AND COMPLETED READY TO SHIP. PLACE ORDER & YOU WILL BE CONTACTED AS TO PURCHASE PROCEDURE. 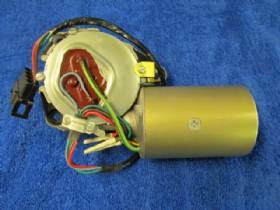 WINDSHIELD WIPER MOTOR CUSTOM RESTORATION OF YOUR 3431077 70-71 E BODY, 71 B BODY VARIABLE/3 SPEED RESTORE-ABLE CORE. 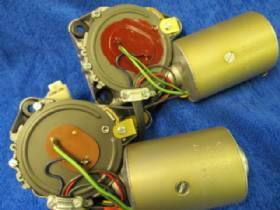 RESTORED OE 3431077 70-71 E Body & 71 B Body WIPER MOTORS. CUSTOM RESTORATION OF YOUR RESTORE-ABLE 3 SPEED/VARIABLE 2983116 WIPER MOTOR FOR 69-70 B BODY AND 69-71 A BODY FOR AUTOMATIC OR 4 SPEED CARS. OPTION CHOICES AVAILABLE FOR 4 SPEED OR 4" AUTOMATIC PIGTAIL, UNIQUE ORIGINAL STYLE ONE PIECE GASKET OR THE FOAM TYPE AT NO EXTRA COST. CHOOSE FROM DROP DOWN MENU. CUSTOM RESTORATION OF YOUR 67/68 A OR B BODY RESTORE-ABLE 3 SPEED/VARIABLE 2585697 OR 2889982 WIPER MOTOR 68 B BODY AUTOMATIC CARS, LATE VERSION. 4 SPEED CARS REQUIRE OPTIONAL 4 SPEED PIGTAIL ADDED TO THE TERMINAL PLUG. OPTION CHOICES AVAILABLE FOR 4 SPEED OR 4" AUTOMATIC PIGTAIL, UNIQUE ORIGINAL STYLE ONE PIECE GASKET OR THE FOAM TYPE AT NO EXTRA COST. CHOOSE FROM DROP DOWN MENU. EXCHANGE OR CUSTOM RESTORED 3431624 72 B/E BODY 3 SPEED WIPER MOTORS. EARLY & LATE VERSIONS.IF YOU CHOOSE AN EXCHANGE MOTOR CORE IS NEEDED OR CORE FEE WILL BE APPLIED. 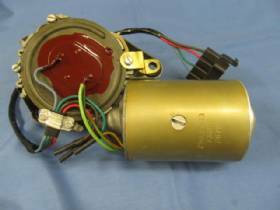 NOTE: SOME EARLY CARS FOUND 3431624 MOTORS WITH THE FLAT SWITCH PLATE WITH INSULATING VARNISH LATER ONES WITH THE BLACK RAISED SWITCH PLATES.WHEN PURCHASING THIS MOTOR PLEASE SPECIFY SWITCH PLATE YOU DESIRE. 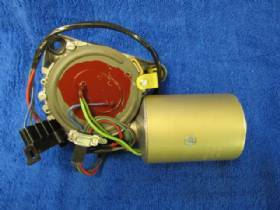 OE RESTORED 3 SPEED/VARIABLE 2580915, 2585697 & 2889982 WIPER MOTOR 67 A/B & LATE 68 B BODY. OPTION AVAILABLE WITH UNIQUE ORIGINAL STYLE ONE PIECE OR FOAM MOUNTING GASKET AT NO EXTRA COST. SEE DROP DOWN MENU.